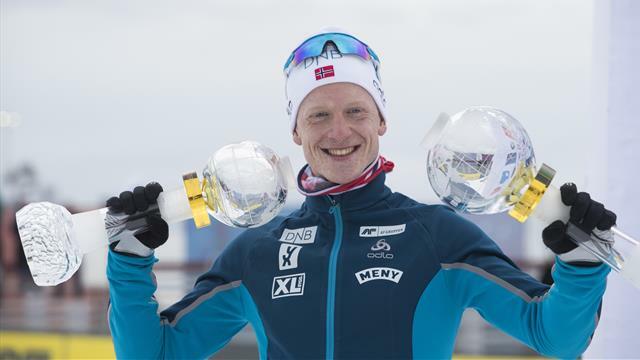 Johannes Thingnes Boe capped off a fine season in spectacular style, sealing his third straight IBU World Cup Biathlon win in Oslo and toasting a victorious encore. The Norwegian had long ago wrapped up overall glory, putting to an end seven years of dominance from Frenchman Martin Fourcade, and it was fitting that he topped the podium one final time on home snow. Completing the 15km mass start race in 37:25.6, he had time to let the victory sink in down the home straight in front of his adoring fans, finishing 19.2s clear of Germany's Arnd Peiffer in second, with Benedikt Doll 38s back in third.